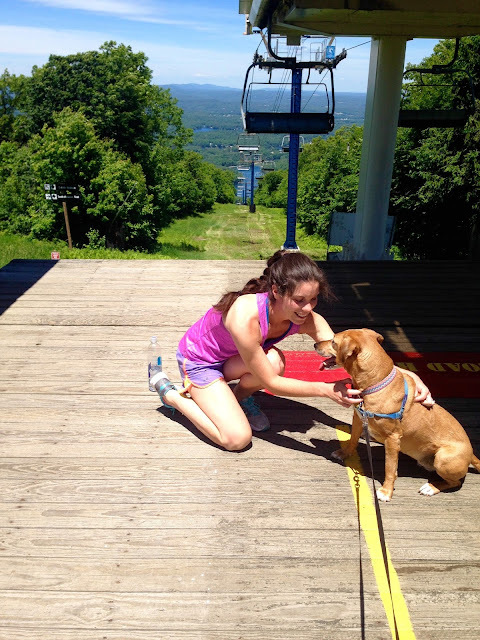 For a refreshing day trip away from rural Connecticut, I ventured to the mountains. About an hour north from Pomfret, Wachusett Mountain State Reservation offers hiking trails for all ages and types (dogs encouraged). As Patrick, Shiloh and I climbed up the slightly steep terrain, I took in the lush greenery and cascading views. Growing up I only knew Wachusett as a ski destination, so it was amusing to be on top of the mountain slopes sans snow. Feeling invigorated after our descent down the rocky paths, my next thought was dinner inspired by a soulful, healthy day in nature. 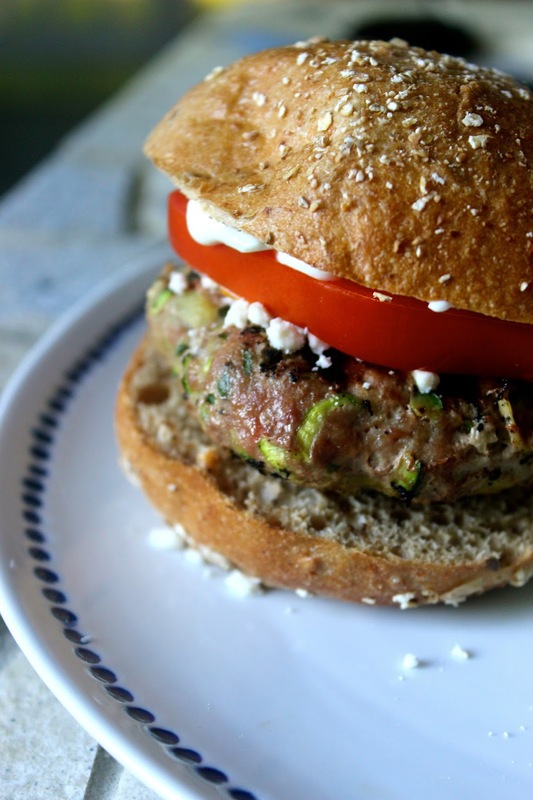 Turkey burgers are a staple in the summertime. They are leaner than ground beef burgers, and are incredibly versatile, depending what you add to the mix. In our Spiced Up version HERE, Marni and I incorporated BBQ sauce, sauteed onions and red peppers to the mix. Overcome by green during my hike, I decided to add grated zucchini which added a bit of moisture to the sometimes dryer patty. I also boosted the burger mix with an array of herbs from my garden. Once grilled, I layered a creamy Tzatziki Sauce, salty feta, and thick and juicy tomato slices on top. The flavors melded beautifully in my whole wheat bun. Healthy and tasty! Combine all ingredients in a bowl and refrigerate until ready to serve atop the burgers. Preheat your grill to medium-high. Grate the zucchini onto a plate and gently squeeze the pulp over a sink with your hands to rid of excess water. Place the grated zucchini into a large bowl and add the ground turkey, herbs, garlic and spices. Gently combine with your hands. Form the mixture into 6 equally-sized patties. Place each patty onto the grill grates and cook for about five minutes per side. Remove from the grill when the patties are browned and cooked through. Place each patty on the bottom of each whole wheat roll. Top with a dollop of Tzatziki Sauce, crumbled feta, tomato, and serve! Serves 6. Variations: If you are not the zucchini type, substitute chopped mushroom to add moisture. If you are not the bun type, serve atop mixed greens.